Part 1: Blue skies over, the White Cliffs of Dover! 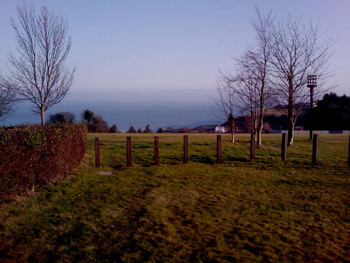 On a Sunday afternoon in late February 2012, members of UK Decay began arriving for their booking at the recording studio situated above the famous white cliffs of Dover. 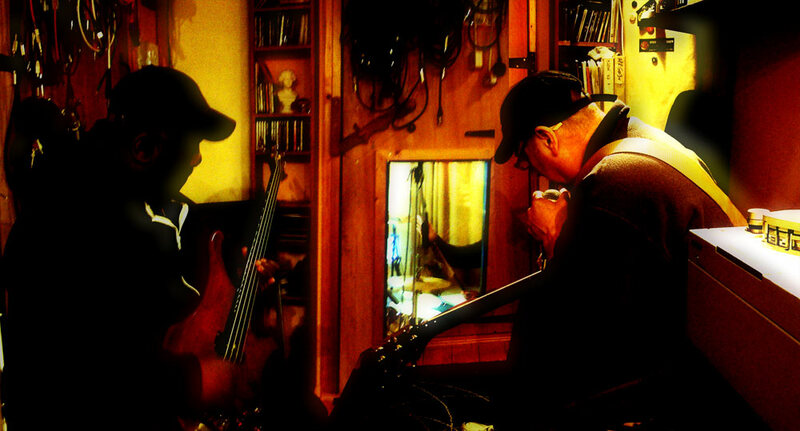 The recording sessions will be our first since we recorded the ‘Rising From The Dread EP’ almost thirty years ago. Together with the help of the www.pledge.com website and our ‘Pledgers’, we had managed to raise much of the funding required to hire out the services of one the rock-guitar worlds most eminent producers, Chris Tsangarides, better known to many as “The Dark Lord” (“TDL”). TDL’s studio is perfectly situated, away from the beaten track, overlooking a holiday park with magnificent views across the sea all the way to France on a clear day. As the light faded to dusk we arrived and unloaded our packed vehicles into a ‘Hi de Hi’ type holiday cabin nearby to the studio, that was to be our lodgings for the next ten days or so. Utilising the studios facilities at this quiet time of the year meant that we had the holiday park to ourselves for the duration, which was real cool! We had a mammoth task ahead, not many bands had left it thirty one years between recording albums! 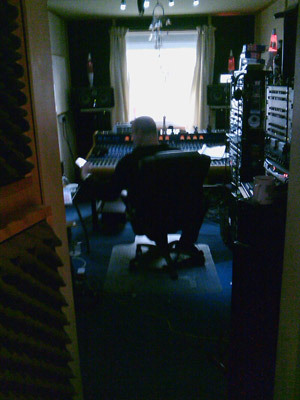 Since the proper reformation of UK Decay in 2008, there has been a lot of talk about new songs and possible recordings. The recent shows have seen us featuring a small number of new tracks in the set. 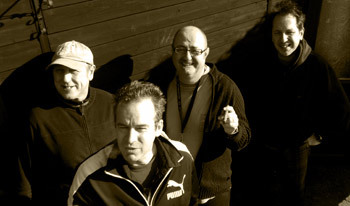 In October 2011, the decision was taken to go ahead with recording a new album. Abbo suggested that we find a specialist producer, who had mastered the art and understanding of recording a guitar and drum oriented band. It wasn’t long before TDL came to light, although primarily a Heavy Metal producer, Abbo recommended that he might be the right guy for us. Back in the first era of UK Decay, most of the band were based in Luton with Ed the bassist making a short journey down the M1 from Northampton for rehearsals, we had it easy then! Nowadays, members of UK Decay live and work far apart from each other and even a simple rehearsal can accrue many hundreds of combined travelling miles. Not very good for our carbon footprint, we know! But for us there is no alternative, saving for working across the internet, sending ideas via mp3’s etc. we had done a lot of that but its still necessary to play together in the same room at times. Over the last few months, ideas and activities have increased as the booked studio dates got closer, culminating in a very active couple weeks before the deadline. Then with one week to go, a serious problem manifested that would affect our plans. Ed the bassist was contending with a serious personal family problem that meant we would not be able to have all the band in the studio in the initial days. He would be arriving later in the session. Initially we tried to change the dates, but this was impossible as TDL had other bands and projects booked after us. So we would have to lay down the drums to a guide and have Ed overdub his bass later on. This is not the usual method of recording bands but then hey! when were we ever a ‘usual’ kind of band! Luckily we had worked out guide tracks on our song demo’s on computer software, complete with raw bass parts, so by utilising these, it would be possible to get around Ed not being available in the initial stages. So in the evening before the first day of recording, drummer Ray and I set up my PC in the ‘Hi de Hi’ cabin and poured through the songs that were about to be recorded. Additionally, having structured the new songs with this software, this enabled Ray and I to really get our heads around the arrangements and the work we had to do. So with a few beers we sat at the computer writing notes and rehearsing parts until at 2am we hit our bunks for the night, tomorrow would be a big day. Ray was up bright and early the following morning and he was eager to get the ‘she-bang’ on the road. Personally mornings are not my best time, but with the inspiration of the blue-skied vista outside and the sea air, I soon got my act together. It was a glorious day! Ray phoned TDL who was ready and waiting for us not one hundred metres away in his studio. 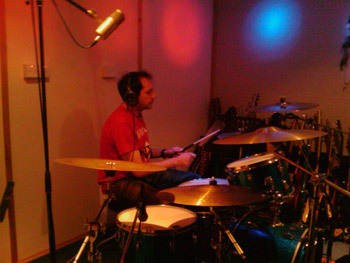 Ray had gone ahead, he would be using a kit largely supplied by TDL augmented with his own cymbals and snare. Before I ventured down to meet TDL for the first time, I took a few steps away from the Hi de Hi cabin to take in the magnificent view. I noted the cross channel ferry disappearing into the distant haze, beyond I could just make out a faint impression of distant french cliffs. I had read up about TDL and his impressive array of achievements of production and had watched youtube videos of interviews with the man. He came across as very experienced and a genuinely interesting chap whom amongst other achievements had invented a revolutionary method for recording guitars, namely “The Vortex Guitar” recording technique. My years since the first era of UK Decay had seen me working and producing music for innumerable others, but now it was my turn to be ‘produced’ by someone else! As a musician it made me very aware of my personal ‘shortcomings’, I had after all abandoned playing the guitar for over twenty five years, only picking it up once again in recent years! I was about to meet the producer-maestro otherwise known as ‘The Dark Lord’. I headed toward the white painted bungalow, round the back were some run down wooden barns, alongside a heavy duty looking outbuilding also painted white. I proceeded to a semi opened laminate door, knocked politely and entered. Inside Ray sat on a chair working on his drum pedal on a table leant against a wall in a slim room. Above the table on the wall there were several presented gold discs on display. 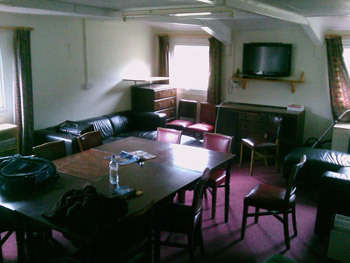 The far end of the room contained a small kitchen and in-between, a door leading to what must be the studio. Ray took me through the door to the studio control room, nice I thought, plenty of valve technology! It was small and compact compared to what you might expect but I could see it was well equipped and designed. The very large mixing desk faced a window tucked between two very nice looking studio monitors. Through the window you could see the cliffs and sea beyond. I continued following Ray through two smaller rooms containing a plethora of musical instruments and recording studio accessories including an upright piano and Hammond organ with Leslie cabinet. We rounded a corner and entered a larger room and in it was The Dark Lord himself, placing microphones round a drum kit. We entered the room and I shook hands with TDL as Ray introduced us. “Coffee?” TDL offered, “Yes please” I answered and TDL took us back to the kitchen where a pot of freshly brewed coffee was awaiting. We sat down at the table and after introductions, we discussed the plan of action for the session. Ray had already filled TDL in with the situation with Ed, so we moved on to how we could go about recording the drums for the songs. We worked out a plan for transferring our PC based guide music files onto his Radar/Pro Tools recording system. That would turn out to involve me running back and forth between TDL’s studio and our Hi de Hi cabin armed with a memory stick, transferring files for much of the first day! The system took a little tweeking to get right at first, but improved as the day went on. TDL’s years of experience and empathy with his vocation shone like a wise beacon, here was a studio seer, a music magus that had worked with the likes of Thin Lizzy, Black Sabbath, Killing Joke, Depeche Mode and Samantha Fox! To name but a few! I felt humbled and yet he had a warmth and sense of inclusiveness that immediately made one feel at home. He had a down to earth attitude with a cunning plan to solve our problems! He led us back through the studio, this time with a narrated tour. At the back of the ‘live room’ with the drum kit was a covered rack, TDL pulled back a large cover and exposed the large rack, perhaps three metres long, bristling with guitars of all denominations. “Feel free to utilise any of these if you like” TDL offered, “Hmm” I thought of my trusted Antoria custom, “Thanks very much – perhaps!”. After a further coffee, I returned to Hi de Hi with memory stick to prepare the first batch of three songs. I needed to export the guide tracks from my software and import the results on to TDL’s system. TDL in the mean time finished the microphone placement and started work on the drum sound in the control room. Ray tweeked the kit and limbered up. Eventually I returned with a working file and we were go for recording the first three songs. Ray played along to the prepared guide tracks which were now in sync with TDL’s system. I hung around whilst Ray went through a few takes on the first of the three tracks. With some adjustments of the monitors eventually we were happy to have the first take in the can. The drum sound on its own was absolutely awesome! I headed back to Hi de Hi to prepare the next batch of songs, on return I noticed it was already dusk, “My God! its already six o’clock” I thought. Ray had recorded a second track and was about to start on the third when TDL announced that we were finishing the first day’s recordings. This was ok as we were now set up to steam into everything first thing the following day. We would have the evening to make sure all the guide tracks were prepared for the remaining songs. Abbo would be arriving later that evening so we would be able to discuss the arrangements with him then. Ray and I drove the car to a local chippy, on return we sat at the large table in the Hi de Hi cabin and ate our nosh. 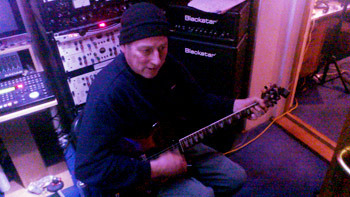 Afterwards we got back to the PC to check over the next bunch of songs and work through some ideas on my guitar. Eventually, Abbo phoned Ray to say he was on his way with Jim. The time was 11.30pm, Ray was knackered, he had a long day Abbo was going to be late. I carried on with my guitar for a bit longer but I too was getting tired. At 1am, Abbo called again to say that he was twenty minutes away. Ray decided to wait up a little longer and eventually at 1.30am, Abbo and Jim arrived. Complete with 100% Nob Creek Bourbon, Baileys, bottle of Rum and fat cuban cigars, the guys waltzed in. We could have been forgiven for taking a swift nightcap and departing for a well earned slumber, but not this time. Abbo, fresh faced and brimming with ideas, wanted to pour over the songs right away. Out came his mobile ipac, laptop and guitar and before we knew it we were back in the thick of working out songs, this time lashed with Jims cocktail concoctions and cigar smoke. Abbo had two brand new ideas for songs he would like to record, I shuddered as I thought about the technicalities involved in making them happen at this stage of the proceedings. Eventually at 4.30am we finally ground to a halt, we discussed a plan of action for the following day and turned in. Day one over! TO BE CONTINUED…..when I get a chance!